With the announcement of DirectX 12 features like low-level programming, it appears we're having a revival of the DirectX vs. OpenGL debates—and we can toss AMD's Mantle into the mix in place of Glide (RIP 3dfx). I was around back in the days of the flame wars between OGL and DX1/2/3 devotees, with id Software's John Carmack and others weighing in on behalf of OGL at the time. As Microsoft continued to add features to DX, and with a healthy dose of marketing muscle, the subject mostly faded away after a few years. Today, the vast majority of Windows games run on DirectX, but with mobile platforms predominantly using variants of OpenGL (i.e. smartphones and tablets use a subset called OpenGL ES—the ES being for "Embedded Systems") we're seeing a bit of a resurgence in OGL use. There's also the increasing support of Linux and OS X, making a cross-platform grapics API even more desirable. 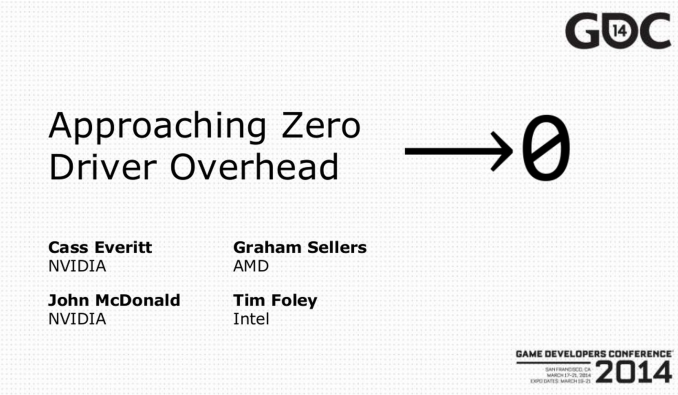 At the Game Developers Conference 2014, in a panel including NVIDIA's Cass Everitt and John McDonald, AMD's Graham Sellers, and Intel's Tim Foley, explanations and demonstrations were given suggesting OpenGL could unlock as much as a 7X to 15X improvement in performance. Even without fine tuning, they note that in general OpenGL code is around 1.3X faster than DirectX. It almost makes you wonder why we ever settled for DirectX in the first place—particularly considering many developers felt DirectX code was always a bit more complex than OpenGL code. (Short summary: DX was able to push new features into the API and get them working faster than OpenGL in the DX8/9/10/11 days.) Anyway, if you have an interest in graphics programming (or happen to be a game developer), you can find a full set of 130 slides from the presentation on NVIDIA's blog. Not surprisingly, Valve is also promoting OpenGL in various ways; the same link also has a video from a couple weeks back at Steam Dev Days covering the same topic. The key to unlocking improved performance appears to be pretty straightforward: reducing driver overhead and increasing the number of draw calls. These are both items targeted by AMD's Mantle API, and presumably the low level DX12 API as well. I suspect the "7-15X improved performance" is going to be far more than we'll see in most real-world situations (i.e. games), but even a 50-100% performance improvement would be huge. Many of the mainstream laptops I test can hit 30-40 FPS at high quality 1080p settings, but there are periodic dips into the low 20s or maybe even the teens. Double the frame rates and everything becomes substantially smoother. I won't pretend to have a definitive answer on which API is "best", but just like being locked into a single hardware platform or OS can lead to stagnation, I think it's always good to have alternatives. Obviously there's a lot going on with developing game engines, and sometimes slower code that's easier to use/understand is preferable to fast/difficult code. There's also far more to making a "good" game than graphics, which is a topic unto itself. Regardless, code for some of the testing scenarios provided by John McDonald is available on Github if you're interested in checking it out. It should work on Windows and Linux but may require some additional work to get it running on OS X for now. Well in the old days Microsoft's dominance on the desktop made Directx win. Today, that's no longer the case. Apple's ios and Android both dominate, and unless MS allows Directx to run on non windows devices, won't have the clout to force Directx 12 on us. Microsoft's dominance on the desktop still makes DirectX win there. On mobile, small games go straight for OpenGL ES but larger games use third-party engines that handle the divide. Also, the way tablets are going, we're going to be back to the 90s soon enough. Intel-based Windows 8 tablets likely take over much of Android's strength in productivity tablets, and Apple will always have the iPad for content consumption and overall luxury. Android has had a good run, but counting on Dalvik as the center of your OS (which is bound to the weaknesses of Java) puts a damper on Android power efficiency, performance, and scalability which can't be recovered. Android probably dead-ends somewhere between 5.x and 7.x, where Chrome OS takes over on Google's side and subsequently loses a huge install base. I can't see how it's a problem. Windows' lagginess never hurt its platform after it had platform dominance. Windows tablets have the same problem as Apple laptops - they don't have the compatible software and probably never will, they're the domain of artists (with the stylus) and wintel grognards. For all your bluster, PCs with touch aren't selling and tablets are still primarily ios and Android. I have no idea how Google would have plan to upgrade from Davlik to Dart considering Dart is a replacement for Java Script and not Java which are two different things.